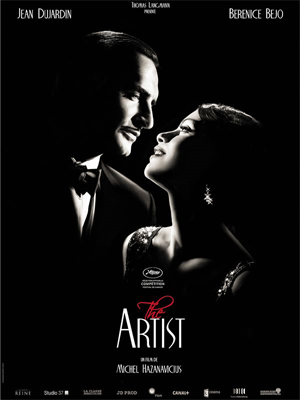 The Artist (2011) – Here’s to January in May! The idea behind choosing this film as my first write-up stemmed from the fact that in theory it would be supremely easy for me to get ahold of, you see it has been sitting on my movie shelf since 2012. I bought it not knowing much about it other than the general conceit of it being a film done in the silent-movie style that won a slew of Oscars (Best picture, and I would hope Best Dog Actor among them.) I figured I would love it. Sadly, it has sat on the shelf, shrink-wrapped and gathering dust while I walked past it day after day. This blog has provided the perfect reason to finally check it out and (a mere four months after I meant to) I have finally been able to spend some quality time with this film. The year is 1927 and the place is Hollywoodland. It is the heyday of silent-film and our hero is George Valentin (Jean Dujardin), a movie star in the most classic sense. Handsome, dashing, talented and with an ego to match. All he wants from the world is complete, unconditional devotion, and based on the reaction that his newest picture is getting from the audience, he’s got it. As such he is a cad, a glory-hog and a bit of what we might refer in todays’ parlance as a douchebag. But as it is with all good rakes of his kind, a humbling is on the horizon, and his particular troubles are coming in the form of the talking picture. But for now he is riding high, the audience loves him, his pictures are a hit, the studio bends to his every whim and what’s more he has by sheer good luck met beautiful ingenue Peppy Miller (Bérénice Bejo) a rising star. George stands tall and proud watching the audience devour his latest film, master of all that he surveys. A sign that warns to ‘PLEASE BE SILENT BEHIND THE SCREEN’ looms over him. And thus we begin The Artist…a glowing love-letter to the era, aesthetically and thematically, a moving examination of the successes and hardships of the people dealing with the transition to sound filmmaking and film that I really should have watched a long friggin’ time ago. What draws me in the most is how well director Michel Hazanavicius and his team play within and without the aesthetics of the silent film. The picture is black and white throughout, grainy (though I think they could have gone grainier), filmed at 22 frames per second giving you that nice choppy motion and is presented in the classic academy 4:3 ratio, just like ye olde silent films. The intertitles help to clarify long silent speeches, lip reading sometimes clues you into bits of dialogue, and actor mugging takes care of the rest. Most importantly it all feels true to the genre. Of course, what you really want to write home about is the way that the filmmakers use sound. @MisterGreggles and I recently attended a screening of Metropolis (1927) and we were fortunate enough to see it with a live orchestra. So I still have that experience fairly fresh in my brain, and I have to say that they really nailed that symbiosis between silent film music and picture. The music does a beautiful job of conveying the feeling of the scene, solidifying the performances (which are great on their own) and communicating story points. For example, a scene late in the film has George discovering a stockpile of items he had to auction off following his downfall. Initially I figured he would be happy to find out who had purchased everything but once those ominous strings and tympanies make their presence known: you realize no, no he is not happy about this at all. Sound effects are also used to jarring effect in the film, and when the audience is finally rewarded with a bit of honest-to-goodness dialogue, it is in a wonderful little moment that ties up loose ends and sends you off with the warm and fuzzies. I like how the film uses sound to step outside of the constraints of the silent film era. It is an homage to the era, but not slavish, and when the film does decide to transcend its boundaries, it does so in beautiful, meaningful ways. I think I enjoyed this movie a lot because I have a particular fondness for movies about moviemaking, and one of my all-time absolute favorites is Singin’ In the Rain (1952), a film which shares many many MANY thematic elements with this picture, and also features a story about the chaotic transition from silent to sound era. I have no doubt that the little nods to that picture and so many others were intentional. It’s obvious that the filmmakers have a great love for film. (One of my favorite bits involves Missi Pyle as a Lina Lamont type, George’s current leading lady who wants just as much admiration as he does. I haven’t even talked about the acting, which employs just enough “dumb show” to be genuine to the era but not enough to turn off modern viewers. I love the scene where Peppy is giving an interview and dogging silent film actors as clowns who do nothing but gesture and mug for the camera, while the film dictates that she must essentially do the same to communicate to the audience. Sweet sweet movie irony. I was also afraid of the name actors taking me out of the experience, that I would be lulled into the story and the aesthetic only to be confronted with Malcolm Mcdowell or James Cromwell for lady from Speed (1994) who freaks out and goes for the bus door only to end up as a pile of gibbly bits. (How is it by the way that the first bomb only blew up a 2×2 square at the front of the bus…that was a pretty hefty digression. My bad.) Anyway, they are all welcome and fit nicely into the world, Cromwell does really nice work as the loyal driver (cut from the same cloth as Alan Swann’s driver from My Favorite Year (1982)) and John Goodman will make you believe that a beta studio head could actually be a real thing. So I did go on a little bit there. Okay, let’s wrap it up. Needless to say, I loved this film and I am thankful for the opportunity to write about it here. I know that watching films (good and bad) is good for the filmmaking soul. It informs the way that I make my own films and is just a good thing to do in general. I don’t do enough movie watching, frankly. But I hope to change that by continuing this journey with all of you. This entry was posted in @Peaceman630 and tagged the artist by campbelldropout. Bookmark the permalink.